We need to unprotect workbook at the beginning of the procedure to do any changes to the workbook. If you forgot the password, you cannot unprotect the workbook. Why we need to Unprotect a Workbook using VBA? 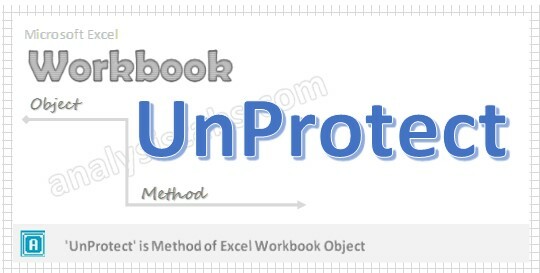 Unprotect method of workbook object has no effect if the workbook is not protected. It removes protection from a workbook. Here is the syntax to Unprotect workbook using VBA. Password: Its Optional argument. It specifies a case sensitive password for the workbook. When you want to unprotect your protected workbook you must specify your password. Structure: Its Optional parameter. The default value is False. If we mention it as True that means protect the workbook structure. Windows: Its Optional parameter. The default value is False. If we mention it as True that means protect the workbook windows. In the above syntax we are using ‘Unprotect’ method of workbook object to unprotect the workbook. Please find the below example, It will show you how to Unprotect the workbook. Press ‘F5’ to run it or Keep Pressing ‘F8’ to debug the code line by line.